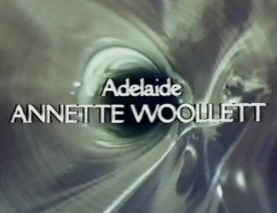 Adelaide: The Annette Woollett Online Center. Why an Annette Woollett Page? I suppose it is necessary to give some background to what may seem rather an odd site, being as it is devoted to an actress whom I have seen in one role in a near 30 year old Doctor Who episode. 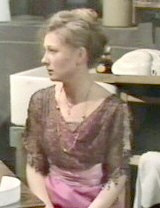 I can only relate that from my first viewing of "The Horror of Fang Rock" more years ago than I am eager to divulge, I was always captivated by the loveliness of Annette Woollett and her portrayal of Adelaide, and in the course of several years afterward of searching for the episode on video was always annoyed by the negative reactions of fellow viewers towards actress and role. (See "Adelaide: the controversy" elsewhere on this site.) Therefore, as I now have acquired the episode on video and extensively screencapped every scene in which Annette appears, I have decided to create this site in order both to rebut the critics and provide a scene by scene archive of her images for any other fans who might somewhere exist. If you are that other person, this site is dedicated to you!